Home / LIFESTYLE / GARDENING / Ready for the season? Hi and welcome again to Green Arts – with a nod later also to the brown soil arts – and with special reference to the smaller garden. This time of year most gardeners are a blur as they rush around preparing for the summer season – so much of the art of gardening is in the preparation – at the same time as they are responding to the many tasks the fast new growth suddenly brings about. The first mowing of the year and weeding comes to mind – the timing of these tasks is important to avoid them becoming more difficult than they need be. The excitement of the first sighting of spring bulbs last month is always quickly followed by more pleasure from the first flowering plants. This month there will be lots of spent bulb deadheading to do – but do let the leaves die down. Of those shrubs and trees in flower as I write, (depends where you live) three plants have caught my eye; two as being good candidates for a place in the smaller garden and another, if you like it as much as I do, offering use as well as ornament. 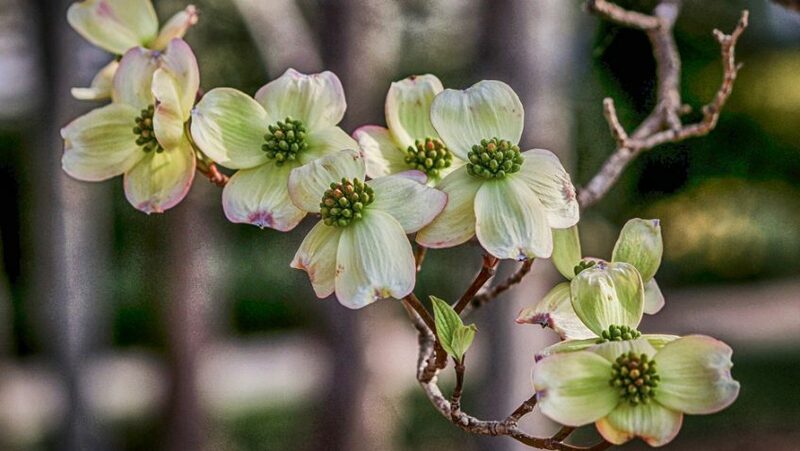 This month’s banner heading shows the beautiful and unusual flowers of Cornus florida ‘Cherokee Chief’, early flowering although not one of the first. This attractive small tree, ideal for the smaller garden, grows to a height of between 4 and 8 metres but is very slow growing and will take 50 years to reach full size. 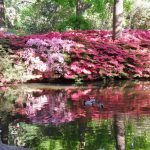 Give it a moist and fertile soil (that is a clay soil broken up by your addition of lots of organic matter) and a part-sun part-shade sheltered spot to enjoy the pinky-red flowers in mid-April. Keep the soil evenly moist to avoid the powdery mildew which tends to afflict this tree. Now is also the time to plan ahead for summer bulbs. There is still time to plant lily bulbs in pots – two good examples might be the vibrantly coloured Asiatic lilies flowering in June/July and fragrant trumpet lilies flowering in July/August. 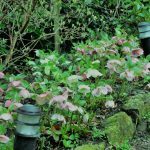 Plant them in pots – then they can be moved around and sited in the gaps where the garden could well be lacking in interest later in the summer. 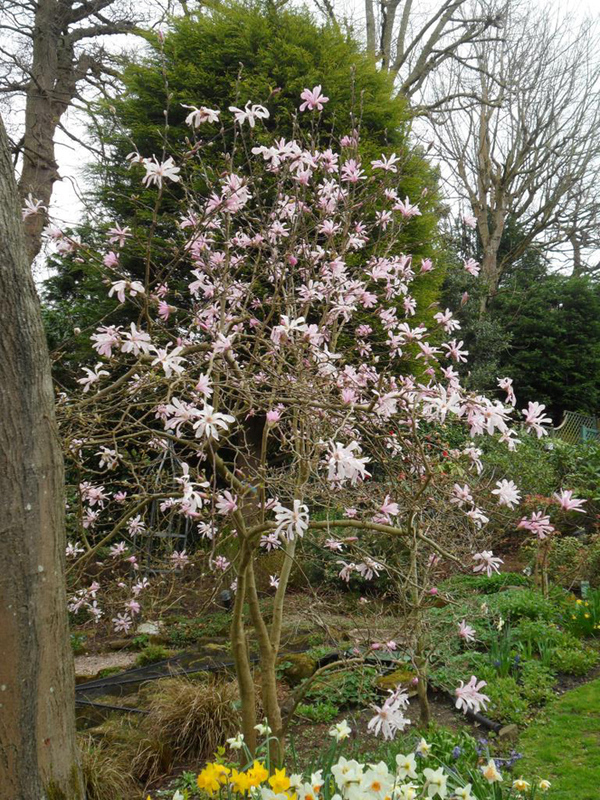 Size-wise Magnolia stellata, a small tree originating from Japan with a maximum height of 2.5 metres, can fit into a garden where a full sized Magnolia would be out of place. It has that characteristic of several first-bloomers in that it blooms initially on bare branches. The leaves catch up later. As a young tree the outline shape is oval then as it grows towards maturity the shape changes and it starts to spread out into a broad crown; a space consideration that also needs bearing in mind in the smaller garden. The colour range of M stellata’s star-like flowers is white or pink; the pink hue tends to deepen or lighten depending on temperatures. 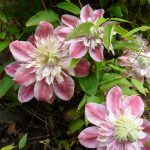 It appreciates moist and boggy areas and, if possible, is best planted amongst other plants rather than adjacent to a lawn edge or path so that the fallen petals are less noticeable. The flowers of the early flowering Chaenomeles are delightful; an old-fashioned plant maybe, much loved by the Victorians, but today still a popular purchase originating from China, Japan and Korea. Modern cultivars of this plant offer a broad flower colour range from white through pink, salmon pink/apricot, orange through to scarlet and very deep red. I always think people buying this plant must fall in love with the flowers alone as the natural growth habit of Chaenomeles is, for me, far less of a draw. You could cut it down and keep it as a lowish hedge when, thanks to fierce spines it can act as a deterrent to intruders. But the ever expanding width of that low hedge – which turns into a thicket – makes it less useful in a small garden unless a very short variety is chosen at the outset. My preferred way to display this plant to best advantage is to wall-train it. Climbers and wall shrubs are good news in the small garden; colour and foliage flattened against a wall or fence taking up very little space and making a great display. A number of plants can be successfully trained this way even if it isn’t their natural growth habit. 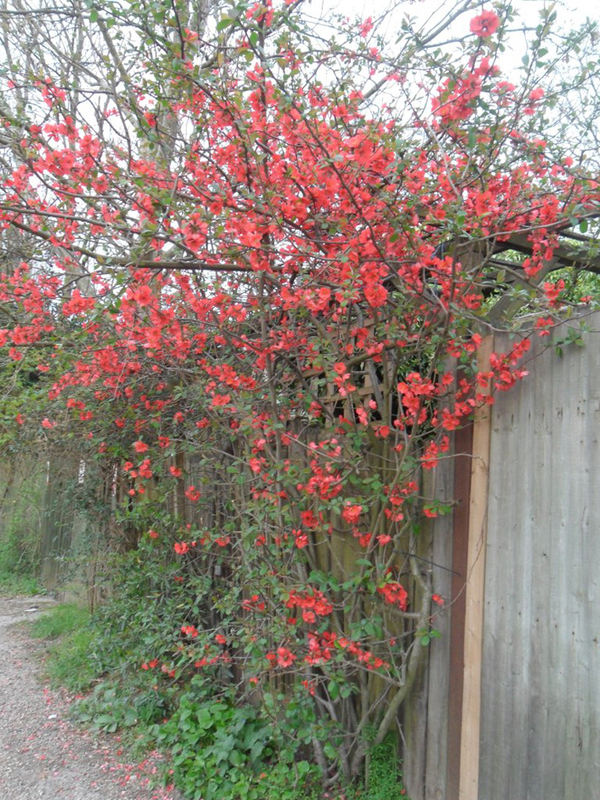 Chaenomeles can easily be wall-trained or espaliered and it is the perfect way to display the flowers. Some patience will be needed because the full display won’t be evident for a couple of seasons but the final effect will be well worth the wait. One of the more common names for Chaenomeles is the flowering quince and this has led to understandable confusion. Most of us know that quinces are edible and often this leads people to ask if the same is true of Chaenomeles fruits. Truth is that they are indeed edible but in my experience they are usually rather small and few per plant. All the seeds need to be removed from the fruit (these seeds are not edible) so that doesn’t leave much to work with. No so long ago Chaenomeles the flowering quince, and the fruiting quinces grown specifically for fruit production were both considered members of the same botanical family. This is no longer the case. In both cases the fruits are too bitter and acid to eat raw and are usually made into jams and jellies, often with the addition of other sweeter fruits like apples. 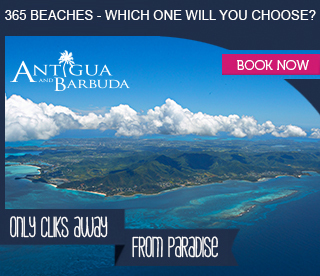 They can also be turned into a fruit wine – said to be very good. I have seen large quinces, up to the size of a medium pineapple, liberally peppering the fruiting tree variety – a better proposition for food making compared to the smaller, sparser fruits of the Chaenomeles shrub the true value of which is ornamental. Gorse is sold as a hedging plant for countryside places. It ticks a number of boxes so I include it even for a small suburban garden where, soil suitability allowing, it would be a fine addition to a mixed hedge or in a larger garden as a stand of bushes. I really like the strong yellow colour of the pea-like flowers, abundant at this time of year, against the dark blue-green of the needles. A plant for sandy soil rather than heavy clay (you could try it with plenty of added grit,) Gorse is at home on poor, dry, acid soil when it will grow to a maximum height of 3 metres. When it is “at home” care should be taken not to allow it to become invasive. One of the first of the year to flower Gorse provides an important source of nectar for bees and birds at a time of year when there is little else. It is also useful to humans. 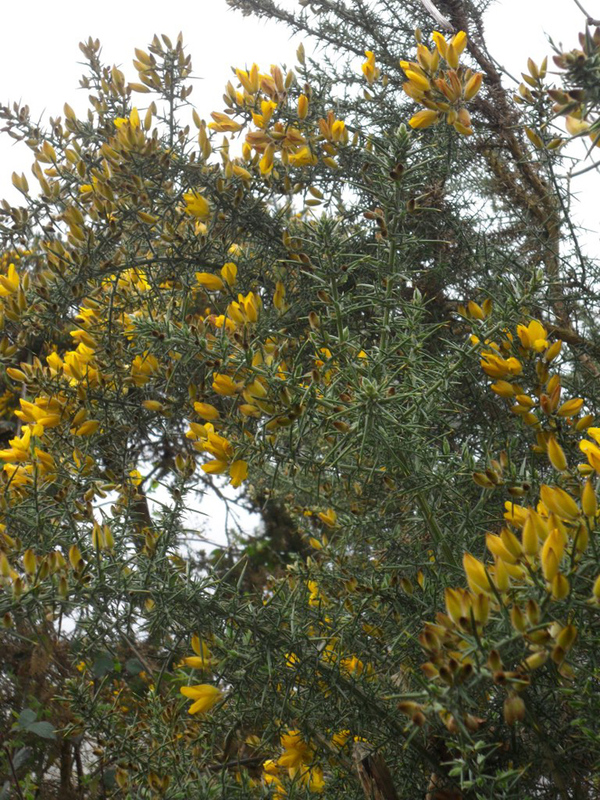 Gorse flowers are edible and can be used in salads, teas and fruit wine – apparently tasting pleasantly of coconut. 2016 seemed to be a particularly good year for Gorse – the flowers really abundant. 2017 seems to be Rosemary’s exceptional year, I can’t remember seeing it flower so profusely before. I have a sizeable plant in the garden that I went to last week to get four sprigs for a recipe. I could not find any part that wasn’t smothered with flowers. Perhaps you will have noticed that I am not averse to remoulding plant shapes to suit. Some purists dislike this tampering with the natural. It seems to be a marmite thing and so not something that can usefully be discussed. My own view is that a garden is necessarily created by artifice and perhaps it just depends on where you draw the line. Over the centuries gardeners have adopted many different ways of improving the display by changing natural growth habits as I described earlier. Nowhere is this more useful than in the small gardens of city dwellers. 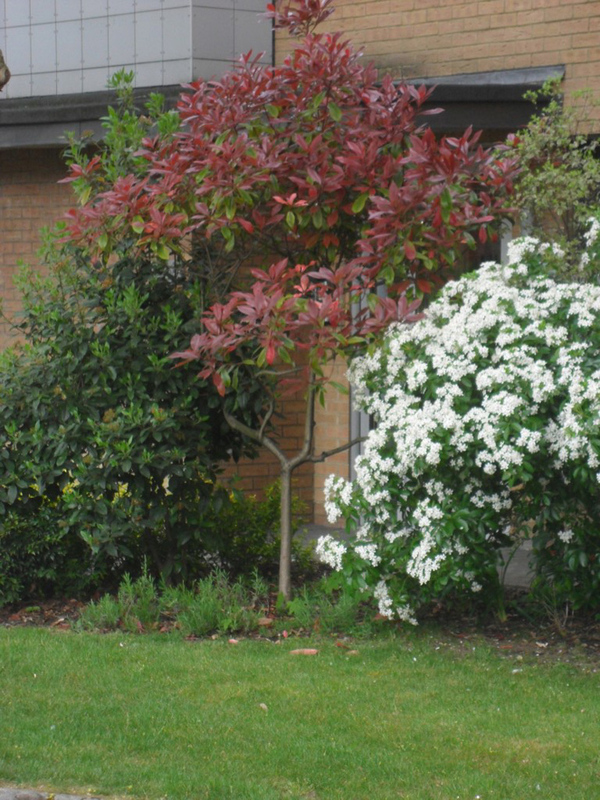 As I look at another plant, Photinia ‘Red Robin’, that offers an early burst of colour I am mindful that this, again, can thicken up considerably and become overly wide. A good way of getting the benefit of the bright red early leaves where space is limited is to strip the main stems of branches to a chosen point. The outline of the plant has been changed completely but very little ground space is taken up. There is plenty of scope too for underplanting with bulbs or maybe a favourite ground cover plant. My current quest for more fertile soil continues. I am an avid recycler of everything possible. When transporting the eggshells, tea bags, and veg and fruit peelings of my kitchen waste from that kitchen to the outside world I find it strangely fascinating to think that the skins of my bananas come all the way from the Cameroons to end up in a compost heap in a London suburb. No doubt, over time, some pretty unexpected matter has found its way into our soils in the quest for fertility and better crops but thanks to microbial soil life, and this is equally a thing of wonder to me, whatever conglomeration of shapes, colours and textures goes in what comes out all of us would recognize as soil. Last month I talked about my raised bed preparation on the allotment which I have since finished. 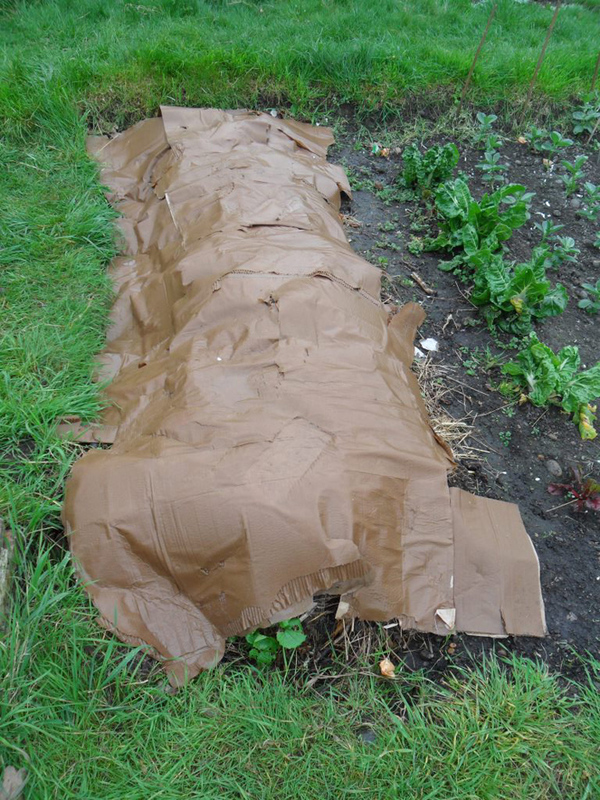 The layers of water-soaked cardboard were applied first followed by a heavy layer of own-made compost. I will give it a while before planting the heavy feeders (courgette, squash, marrow) currently sitting in the cold frame into the bed as there is still a risk of frost. Harvest-wise I have had two major cuttings of Chard, a great favourite, already this year. If you wish you can find recipes for all the jams and wines mentioned on the internet. Happy gardening until next time.